October and Halloween came and went and now we are nearing the middle of November, with the cold weather and early sunsets, this year can’t be over soon enough. After my last posting, Optometry and Friday the 13th, I had just got done seeing my optometrist for eye styes and discussing my Crohn’s Disease Essentials and Emergency Kits. After seeing the Optometry doctors, I had looked up the doctor’s notes on my VA website. In the notes, they had put that I needed a repeat visit, which we already knew, but she had mentioned specific medical terms like ruling out sebaceous carcinomas, madarosis – losing eyelashes, and, internal hordeolum, or styes that occur on the inner part of the eyelid. Go figure, those are rarer. The next visit, on Thursday (today), we will do a full eye exam and recheck my right eye on the bottom and top lid. I know the small stye on my bottom lash has not gone away but at least the swelling and sore on the top has calmed down. I’m still missing some eyelashes, though, and I’ve noticed eye irritation all month, even on the inner corners instead of outer. I’ve noticed pulling down and inspecting my eyelids that even my left eye seems to have an internal style as well, but this one has been there for months and has never caused an issue. I think these are called chalazion. Since it has been a while since I’ve seen my montage of doctors, November gets to be a busy month for me with a few three-month follow-ups, new doctors and an Entyvio infusion scheduled. I have five appointments already, with one needing to be scheduled. I had to meet with my Neurologist, it was time for a follow up about my migraines and it was also to discuss my allodynia. If you remember, I had seen my Primary Care doctor for my all over body pains, and she had noted that I see my neurology doctor, too. When I visited neuro, the doctor upped my Nortyptaline medication, from three to four so that we can help curb or stop the migraines I have each month. They have cut down drastically in occurrence and length they last, but we aim for me to have NO migraines each month; another pill added to the bunch. After working out the migraine plan, we talked allodynia. I explained the overall pain, like I’ve been kicked repeatedly and my body is one large bruise, with it coming and going sporadically and with no rhyme or reason to it, the doctor agreed that it was allodynia, even think in about Fibromyalgia (FM) – I’ve mentioned that a few times because of all of my symptoms. Instead of the neurologist ordering every blood test they had, she wanted a referral to see a rheumatologist, another new consultation and new doctor for me. Because she thinks it could be FM, too, she thought rheumatology could help in the investigating and in diagnosis if needed. I have not scheduled that consultation yet but I should be doing that soon. – They actually called today and I cannot even be seen for my consultation until February. I have had two appointments this week so far, with the optometrist schedule for tomorrow. On Monday, I visited the musculoskeletal clinic about my wrists and thumbs. I was seen in June, with an MRI on my hands in July. I had not seen or heard from them since. When I called in September, this past Monday was the soonest I could be seen. When I went in for my appointment, they had no records from my MRI at Georgetown hospital. I had to call the radiology department I’ve there and request that they fax over everything. I was a little shocked considering it had been around 4 months? With the scans and another ultrasound done, we decided that it was a Ganglion cyst. Instead of getting another steroid injection, we agreed to aspirate the cyst and drain the fluid. Because I am on Prednisone, more steroids would not be good. The doctor numbed my cyst area with Lidocaine and inserted a large needle into the cyst, going in from near my thumb and took the needle down the back of my hand parallel to the wrist until she got to the cyst. The doctor used the ultrasound to guide the needle to my cyst and she drained around 1cc of clear fluid, it was a definite Ganglion cyst. My MSK doctor told me that draining the cyst would help but there was a chance of it returning. You can see the bruised area, it is still pretty tender and sore. If the Ganglion cyst does return, she would give a referral for me to see a hand surgeon to remove the cyst completely. I have a repeat appointment scheduled for January to check on it and see if it has returned. I followed up with GI the next day. Dr. S was unsure of how my Crohn’s disease is being managed or not managed, and since I haven’t had a biopsy in two years, we scheduled my 5th colonoscopy. I had suggested another pill capsule but because no biopsy can be taken, a colonoscopy was the only option. Dr. S was going to order full blood tests with my normal kidney and liver panels at my next infusion, and in a few weeks time, I’ll have the next scope. And even more, since the VA job didn’t pan out as planned, I just got hired with CosmoProf, a professional beauty supply store. I went in this week looking for hair color before my gore glamour shots, and I see they were hiring. Having my cosmetology license, I went in for an interview today and was immediately hired. They LOVED Mary with the green hair! I’ll actually begin training tomorrow! I had to find green hair color for my shoots this week, I cannot go with the yellow murky looking color it fades into, and since the Arctic fox phantom green fades so quickly, I set out to find some Manic Panic enchanted forest. I went to two Sally’s, a Target, Hot Topic, Ulta, and then CosmoProf. I never found the Manic Panic I needed but I did find a kelly green by Joico that is to die for. The color is so perfect, I may stick with it for a while. I changed my Instagram name this past Sunday. That may not be that big of a deal, but I’ve been MaryQuiteContrary since the beginning, circa July 2012, and I almost felt bad letting it go. Hopefully, no one ever notices it up for grabs. But, I changed it to Marywiththegreenhair, for obvious reasons. Hell, when I go to The Burl, that’s how all of the bartenders know me by name. And then there’s yesterday and today. Yesterday, I went to Shelbyville for ‘gore glamour’ shots, blood and plastic themed. I know a photographer who has done a few models with this style shoot, I had mashed how much I loved them and next thing you know, I got to do a bloody set! I got stained pretty good from the fake blood I made, but I am excited to see the results! I’ll share those as soon as I can. Today I had my follow up optometrist appointment, a full eye exam and all. I was oblivious to what to expect and I was shocked what I had to get done. She looked at my styes and decided that a daily Doxycycline would help prevent them. We did an eye exam, and to be honest I’m not sure if I’ve ever had it done beyond the Navy. Funny enough, the only thing ‘wrong’ with my identical twin is that she wears glasses and I don’t. She is farsighted with astigmatism and then I have everything ‘wrong’, from my Crohn’s to migraines, allodynia, cysts, skin issues and insomnia, she’s good to go. Well, go figure for me, the doctor tells me that I’m a little farsighted, too, and that I could get ‘readers’ if I wanted to. Since I am on my phone, computer and I read often enough, it was probably smart that I buy some cheap ones. She gave me a prescription and told me I could buy some from the ocular store at the VA, but I scratch, lose or break sunglasses so often, I needed cheap cheap ones that I could ruin. Then, she wanted to dilate my eyes and somehow I had never had this done before. She put some numbing drops in my eyes that was bright yellow and burned a little, then used a machine to touch the front of my eyes! It was like a scary movie, I wanted to blink when it got close to my eyes. After she did this, she inserted more drops, this time for the dilation. With the drops in, I got to sit in the waiting area as my vision started to blur. The dilation made it so blurry to see that I couldn’t even reply to messages or read off of my phone. The doctor was a little nervous that I had driven myself and that my drive home was around 20+ minutes, but I told her I’d be as careful as I could. She shined a bunch of lights into my eyes, I was sure I would get a migraine today. As soon as I got into the car I took my Imitrex to be safe, and I had to drive super careful on the way home. Then, I bought some cheap glasses and then I tried to finish this blog. I will note that if you remember, I had my DNA tested through 23andMe, and every so often I will receive emails with updates or new information. This past email update, they discussed Celiac, which I found interesting considering my bowel issues. According to the update, I did not have the genetic markers for Celiac, which makes sense because I have had the blood test numerous times. 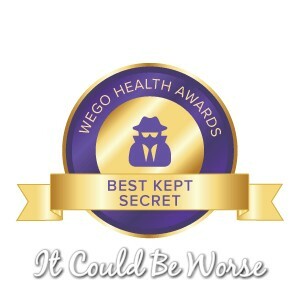 And then, It Could Be Worse Blog was listed in an article on MedicalNewsToday titled the Top 10 Crohn’s Disease Blogs, so I am forever grateful for the awareness and support of my followers and readers. I do apologize for the delay in posting, Sunday will mark a month since my last post, but so much has been going on. Veterans day also came and went, and I made sure to go everywhere I could to get my well deserved free meals. And my Sundays, they’re taken. Like the summer, I have been seeing Sundy Best or The Revival, even seeing them throughout the week if I can. I love seeing the live music, it makes my days that much better. With all of my chaos going on, then my father had a stroke on top of it all. He has never had problems, well, he never goes to the doctor so we really can’t say never, but this was the first scary incident with him. He had suffered a stroke on a Sunday but refused to see the doctor until Tuesday. Then there was drama with my mother, my entire family has been stressed, I just get caught up and I never have enough time. This upcoming week will be my training week at CosmoProf, we will celebrate Thanksgiving, I have one photo shoot booked, and then I’ll prepare for my Entyvio infusion #5 and the colonoscopy a week later. Hopefully, better days are ahead. And as always, any information you’d like to offer up about Remicade infusions or any of my current struggles and/or issues, I have open ears and I’ll happily take any tips you have to offer! Keep up the fight and continue keeping the faith. You’re doing OK with a lot of fortitude. Congrats on the new job! Sending good wishes to your family esp. your dad. Happy Thanksgiving! Always remember to be thankful for whatever blessings/deeds you have accomplished and received so far. Even though your health is your 24/7 focus, you still manage to have fun, hustle up work (go girl), and find the humor in all the drudgery. Hats off to you. And yes please, even if all you can type out per week is “I had a rough week”” or “i noticed something hilarious while up at 2 am” whatever just to let everyone know youre alive and kicking.